I spent the first six months of 1992 traveling around Asia, and “Hong Kong” appeared in the Chicago Point soon after my return. Included below is my introduction from A Funny Thing Happened on the Way to the Four-Point! 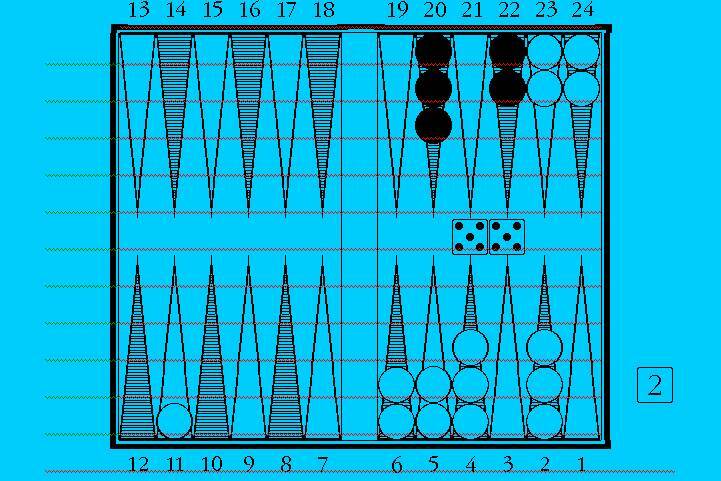 Well, I couldn’t come back without some sort of backgammon story, now could I? This story, “Town Crier,” and “Dong Dong Ju” -- the next two submissions to the Point -- seem to be three of the stories that people remember. At least, I hear more references to them than I hear to many more recent others. Everyone at the house enjoyed this story except John, who claimed I misrepresented him. “I am not an epidemiologist, I’m a gastroenterologist!” Duly noted, John. So, when you think of loathsome diseases, don’t think of John. He is the man to see when you’re not just farting around. On a happier note, John and Glerry are now married, and have their own house. In fact, they have five. A year after this story appeared, John reached the finals of the World Championships in Monte Carlo, and bought a house there to celebrate. I have never played in Monte Carlo, but one of these years I will take John and Glerry up on their kind offer of lodging. Perhaps this story will have some sort of sequel. To understand how high we are, it is necessary to think of descending. The ascent is accomplished in taxis and elevators and a minimum of steps, but the descent can be a long and arduous thing. My friend’s penthouse is on the 35th floor, but merely riding an elevator 35 stories down to “G” is insufficient. Continue down to “P1,” next, walk through the parking garage to building 84, and ride another elevator down to its “G.” From there, you can walk to the Hopewell Center, where you will find yourself entering on the 17th floor. An elevator down to “3,” two escalators to street level - already you’ve reached Queen’s Road. From there it’s a short cab ride downhill to the Wan Chai night club district. The night sky in Wan Chai is a blaze of neon; but from where we sit, it is so far down it might be fireflies in a distant grotto, and the jumbo jets taking off from Kai Tak might be dragonflies rising off of a lake. Four thousand years of Chinese culture, and the administrative might of the British Empire, have combined to somehow put us here, high above Hong Kong. This place is meant for contemplation, for celebration of the elevation of the human spirit, far removed from the crassness and dirt and noise of more lowly abodes. Actually, John is in a good mood. The South China Morning Post has this morning quoted him extensively in an article about malaria. John is the colony’s top epidemiologist. We are joined by Patrick. The sixth race has ended and he has wandered over to kibitz. My friend, Alan, is a horseplayer. On racing days he stays in his office, transmitting bets by CRT and modem hookup directly to the Jockey Club. However, he employs a small army (well, 3) of Chinese assistants who are sprawled around the living room barking additional bets in rapid fire Cantonese over various telephone lines. In front of them is a giant television with up-to-the-minute racing info, and live race coverage. In the middle of the floor is a computer terminal trailing thick black wires like a disemboweled octopus. Patrick has temporarily abandoned his post to offer trenchant commentary on the action. “Only double 3’s hit you! Or maybe 6’s also. I am not sure. During the races I have an advantage in level of concentration. The last time I bet a trifecta it was on a trio named something like “Muc-i-lage,” “Stick With Me,” and “Soon to be Glue,” so I’m the only one in the house not betting. Well, not the only one, but Phil is out jogging, and his girlfriend Becky is out shopping with Alan’s girlfriend Nora, and John’s fiancee Glerry is meeting a friend from Manila; but I’m the only one in the house...except for Remi, their amah, who is upstairs cleaning right now, because it is evening, and since she has seen Phil, and Becky, and Nora, and Glerry all go out, and since John and I are in the living room playing backgammon, and Alan is in his office, the odds are good that there is no one still upstairs sleeping - though one never knows who or what might turn up in Alan’s room. If I were Remi, I would pick this time to haul out the vacuum cleaner and vacuum the living room -- but Remi doesn’t. Perhaps she lacks my exquisite sense of humor. Alan’s last amah, Wilma, had a remarkable sense of humor. Wilma lacked the drive and stamina to attempt something as complex as vacuuming, even in jest. Generally, she sat gazing vacantly at the wall; but if one could breach her remote exterior, one discovered an unexpected wellspring of mirth underneath. In The Sunshine Boys Walter Mathau claims that words containing “K’s” are funnier than other words, so it’s a damn good thing Wilma wasn’t eating knackwurst. Money game. White (Jake) to play 55. Maybe I should break both points, but I play 24/9, 11/6. 33. Just as well I didn’t break the twenty-three point. 31. I make my own three. Money game. Black (Dr. John) to play 21. “Your worst, John! Your very worst!” Patrick has prudently moved beyond arm’s length before pointing this out. Not, however, beyond the range of flying dice cups. I take a deep breath, and empty my mind of impurities. Before me is a painting of Phil’s; a daydreaming penguin standing on an ice floe. Behind him is a string quartet, and emanating from his head is a cartoon thought balloon. In the thought balloon is a penguin standing on an ice floe. Logical. I’m relaxed. I want a roll that is yin, not yang. 11 would be all right. To a Taoist, there is no winning and losing, only a shifting of Yin and Yang. 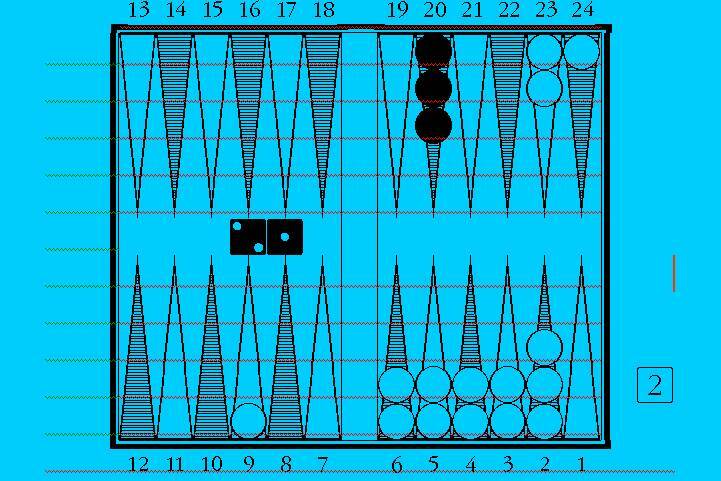 I dismiss the trivialities of earthly existence from my mind, and contemplate how long it takes for a backgammon board to drift serenely downward before it smashes into a million fragments among the lights of Wan Chai.